We played our first games of the scenario for june. Here are some pics and a littel writeup of the happenings as far as I can remember. as she had to less light to make it work. The commandos are ready to leave the building, by fanning them out I tried to keep him guessing where I would go. As my luck would have it there were the suppressors right in my path. You see also one unit of marines which could mean troubles. Close to the silo in front there where the other unit of marines. The miltia was on the other side of the table. Here we are now a bit into the game (somewhere around turn two). trying to hold up the milita there and take out the marines on that flank. One of my units charged the supressors to stop them. The second unit of marines is lurking still behind the silo, ready to spoil my day. 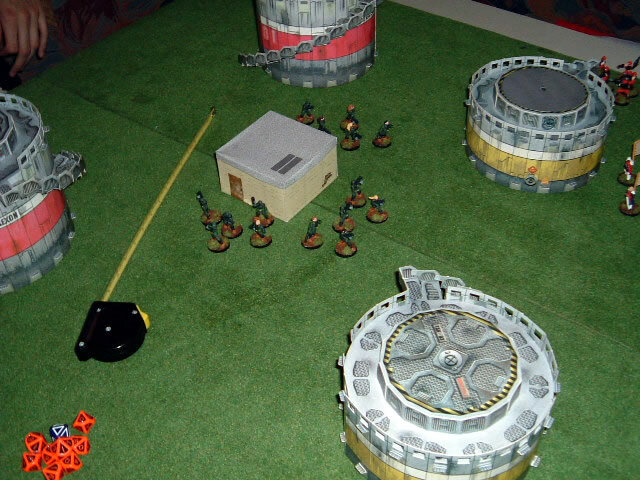 Here they are now, ready to pounce on my poor commandos, which thought they were save allready. 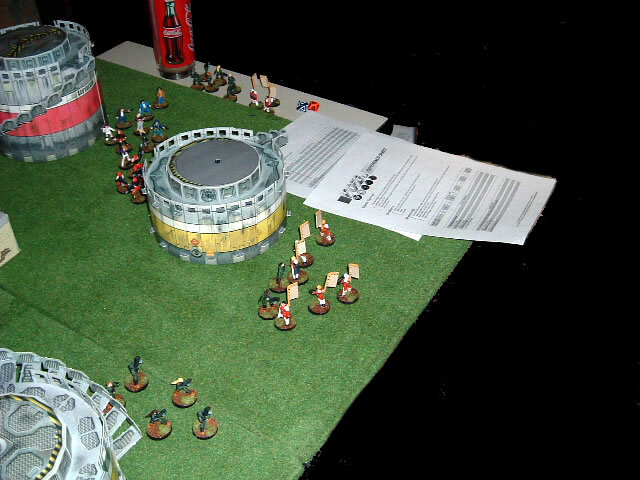 In the background there are the last survivors from the third team. (Currently panicked as the milita brought them under half strength). 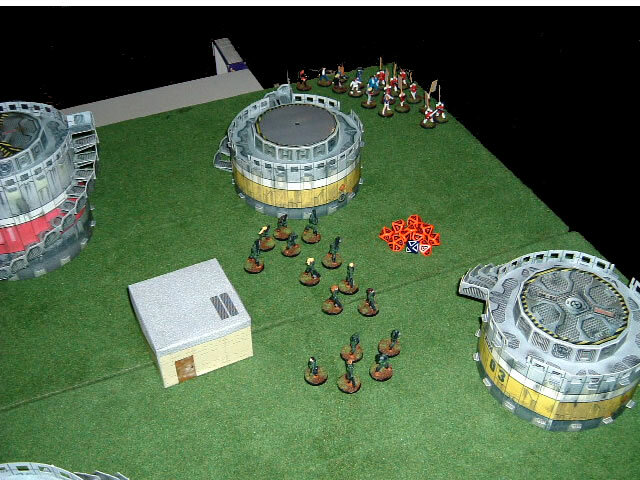 This is the end of the Viridians, the last commando is surrounded by Suppressors and Marines. The Marines in fron made short work of my other troop (due to some increadible dice rolls). I won the first combat round but the marines refused to panic and in the return killed of my commandos. Had two guest battleing it out. Here we have the setup. The Viridians clusterd to one side, like they would make a run off the closer side. But what happened was that he rushed them all towards the front of the picture, where only a unit of militia were stationed (with Sgt Tenko). Behind the yellow silo in the front there where also some marines. Here we see them rushing to safety. (As we all thought). The lead unit would tie up the milita and allow the other two behind her to rush around to safety. 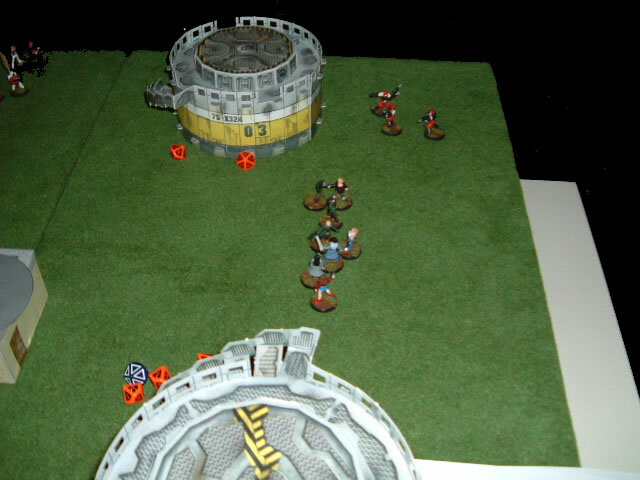 If they would run between the red silo and the militia they would also be farely save from the marines. Thats what we all thought. 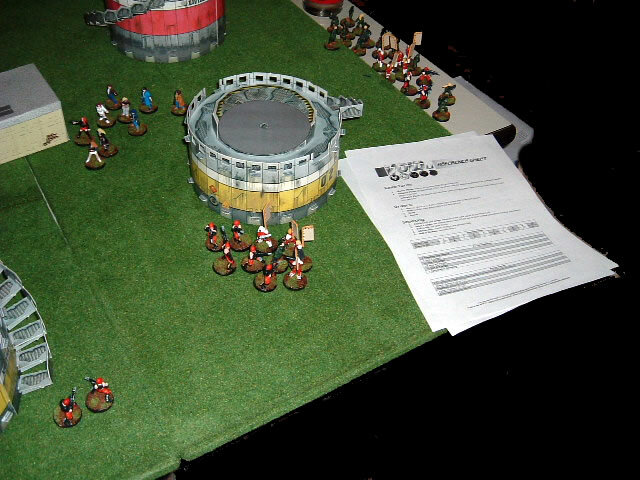 But he not only rushed the first unit into CC with the militia but also the second unit, and both got bogged down. 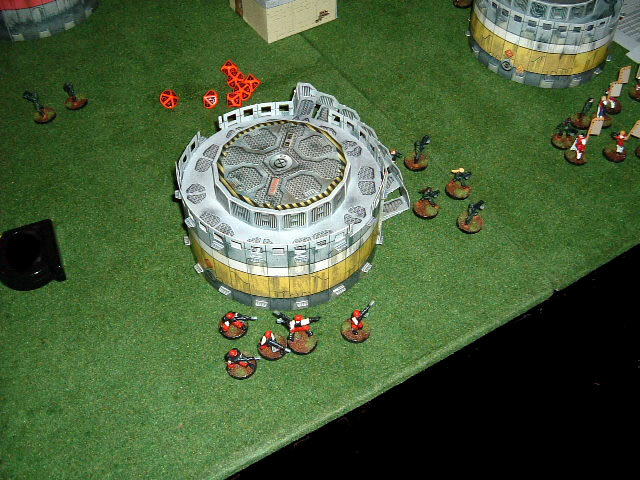 Unit 3 didnt have much impact as a grenade had decimated them allread in turn one and the suppresors chasing them finished it off. So this is the end of the Viridians, of the two units only 3 members are left. The militia held. In the end the marines also charged in and finished them off.